Some of us may live in a historical home. Some of us may just simply have an absolute passion for a particular historical era. Either maintaining a historical home or creating one can be an expensive business. Practical things like restoration aside, when it comes to the decorative part, well, it can be just as expensive if not more. Quite often authentic historical furnishings are rare antiques and textiles just plain rare. And what of the walls? Handblocked or painted wallpaper can require a small mortgage. So without a large budget to match our large passion, we can be slightly thwarted. However, this is where a bit of the creative mixed with a large dollop of ingenuity comes into it. Excluding listed building issues which have strict rules that have to be adhered to, stencils can really help create an authentic historical sense. That is because they themselves have popped up throughout history. For example, when there was a wallpaper tax, people turned to stencils and paint. When there was a window tax, people bricked them in and brandished a paint brush to create trompe l'oeil versions. See, ingenuity. Stencils can work for your walls, your furniture and your fabrics to help create the period look you are after. Here we have used GMT52 a Tudor repeat from our Gothic, Medieval and Tudor range. You can even make it look like old pattern by the way you stencil the design, the colours you use and perhaps even experimenting with a bit of the finest grade of sandpaper or applying a faint colour wash over the top (practice that first on a sample board). You would be surprised how authentic stencils can look. Pretty and subtle stencilling in a bedroom. it was winging it's way to the USA and no doubt the results will look gorgeous and very different from mine. One stencil four ways, Tudor flowers from our Gothic, Medieval and Tudor range. There is a collection of flower stencils in our Gothic and Medieval range. Here are a few ways of using the same stencil to achieve quite different decorative effects. Firstly, we see the Tudor Flowers on a black background. The black walls were clad in plywood and painted with an emulsion paint. A staining varnish was applied over the stencilled decoration to mute the colours. The stencil motifs were applied with acrylic paint and stencil brushes. I used the dry brush method of stencilling. The dry brush method is just as it sounds, very little paint or pressure is used. The paint must be scarcely damp when applied through the holes in the stencil. A different, clean, dry stencil brush is needed for every colour. I made a very short video illustrating this.The cloth on the table and chairs were stencilled with repeating patterns from our Gothic, Medieval and Tudor range of stencils. Secondly, we see the same stencil on a light coloured background. This time, the stencil is not framed within wood panelling but is set at regular, measured intervals across the wall. Our 'Gridfinder' is a good tool to help with measuring equal spaces for stencilled decoration. Thirdly, we see the same design with plaster applied through the stencil instead of paint. If I remember correctly I used an old credit card to scrape the plaster over the holes in the stencil. We can supply our stencils in a thicker film for stencilling with plaster or icing, but on this occasion, I just used our normal weight of stencil film. A heavier film and a trowel for the plaster may have given a more sophisticated result. Finally, one of the same medieval style flower stencils has been applied to a cushion cover. Again, the dry brush method was employed. This link should bring you to another film clip that includes a section on stencilling fabric, and here is another that shows how to blend colour when stencilling flowers. Sometimes you just want drama. Full on, bold, drama. Well, it doesn't get more dramatic than life size architectural details. This is when stencilling can really help. Who says you cannot have a theatrical stage set in your average size suburban home. There are certain rooms that lend themselves to bold decoration. Why not use paint and stencils to create the illusion of decoration and scale that was previously only available in the grandest of buildings. Now you don't have to worry about craning in heavy carved stone and the equally heavy cost to go with it. You can create the illusion and it is jolly effective too. Here we have used a capital, base and column section from our Architectural range of stencils. The idea is that you repeat the column section to get the desired height. You have a choice of 3 different capitals, 3 different bases (the bases can also be turned around and used as capitals even) and 5 different sections. There are two garlanded sections that work with the plain section too. So you have a multitude of options. We have gone quite traditional here with AR11 Capital No. 1, AR1 Plain Section and AR12 Base No. 1, all in the large size. To create the 3D effect is simple. Use darker tones on one side, moving to paler down the other. A few of these along one wall behind the bathtub immediately transports you to classical times and creates a grand atmosphere. Revisiting our Art Deco stencil special offer! This morning my World Of Interiors magazine arrived. It features the apartment of Jeanne Lanvin which is re-created in the Musee des Arts Decorative in Paris. It has prompted me to reissue the special offer on our new art deco stencils that look like the one in the picture. Our collection was inspired by the embroidered blue bedroom that she created with the architect and designer Albert Armand Ratau. Augusta Pownall compiled the Inspirations page in The World of Interiors and she writes that the embroidery has been recreated at Lesage Interieurs based in Paris and Madras. I visited their website, the work is stunning! However, if your budget does not run to just over a £4,000 per metre for the embroidered silk on your walls then our stencils may be the next best thing to recreate the look! Read on for more pictures, colour inspiration, details of the stencils and our special offer. Stencil LAN1 (above) is the stencil that looks like the main embroidery pattern and another stencil, LAN2 mimics the shape of the plaster moulding that goes over it. We went a bit 'freestyle' with elements of the design from Lanvin's bed covers and made a large basket of flowers stencil (LAN7), a butterfly border stencil (LAN8) a large butterfly stencil (LAN9) and a smaller one (LAN10) Order one or all of them to help create decoration for furnishings and accessories. We have 5 more stencils in our LAN collection that do not feature in the photographs above. We are happy to extend the special offer to include them. The full collection is below. The currency exchange rate remains advantageous for overseas customers buying from Britain at the moment...so, take advantage! Spring hasn't actually arrived in the north of England yet even though officially it started a week ago, but here is some floral cheer in the shape of our Larger Than Life Wisteria stencil, code number LTL11. This is a stencil of a supersized wisteria that is divided into elements, in this case a large and small flower separately and different sized single leaves and a few tendrils. The idea is that you piece it together how you wish. These designs are great when you want a feature in a specific area, but don't necessarily want to fill the whole room or space (although you can if wished). Imagine you have this lovely antique bench in a hall space but it looks a bit bereft. Using a stencil like this just to add some detail above it, thereby enlarging its presence, is just the thing. The rest of the walls can remain plain (or not). People look at these freeflowing types of stencils and worry that they are difficult to use. With a bit of thought and planning they are not. Like most things, don't just jump straight in and start stencilling. Make a rough sketch (doesn't have to be art of any sort) working out a general arrangement. If you want to create a feature like this, mark a centre point and work out from either side of that. In this case, the centre is actually two of the shorter flowers so that the panel could end on longer flowers. Do a bit of measuring. You can overlay bits so the flowers can overlap as can the leaves. Finally, it is not a bad idea to have a bit of a practice on some paper. If you have a large design like this, get one of those paper tablecloths and try that or even stick smaller pieces of paper together. Remember this is only so you can practice a section so you don't need extravagant or expensive paper. Designs like this are supposed to be a bit freeflowing so do not have to be regimented. If one flower drops down farther than you intended, don't worry about it. In the scheme of things it probably looks great. These types of stencil designs are possibly some of the most satisying and effective to do because you choose how it looks in the end. Should one stencil with gold or onto gold? There is no right or wrong but the look is very different. To give you an idea, here are two treatments. The top picture shows stencilling with gold and the picture further down features stencilling onto gold. Nowadays it is possible to get a water-based metallic wall paint and there is no doubt that a metallic base coat is a bit exciting. Personally, I feel one can never go wrong with metallics however you use them. It just depends on what volume you want them at. The choice is yours. This stencil is an art deco repeat VN54 Odeon from the Pure Pattern section of our Vintage range of stencils. Stencil Techniques for Furniture; another creative class at The Stencil Library. Do you paint furniture for fun or for profit? Do you teach classes on the subject? If so you may find our day class useful and enjoyable. We have just one date for Spring 2018 and it is Sunday, April 8th, the day after our 'Beginners and Improvers' stencil class. Although this class is geared toward decorating furniture and small projects the skills learned also apply to larger projects. Using paint, metal leaf and glaze we will experiment with a collection of corner, border, repeat and spot motif stencils to create panels, circlets and overall pattern. Special attention is given to corners, symmetry and contrast panels. Simple fantasy finishes will be demonstrated. A minimum of two samples will be created. Materials refreshments and a vegetarian lunch are provided. Students receive written instructions and three sets of stencils to keep. The cost for this day class is £95.00 and we take a maximum of six students. All classes and tours must be booked in advance; full payment is required with your booking and confirmation will be sent upon receipt. 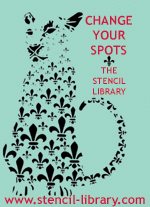 Cheques made payable to The Stencil Library at the address below. Credit card payments are accepted by phone or PayPal. In the event of customer cancellation, no money will be refunded unless 14 days notice is given or we can fill your place in the class. We will endeavour not to cancel a class unless unavoidable, but reserve the right to do so. Find more details on our website, or speak to us.